We have been pretty obsessed with Masterchef for the last few years. Joe Bastianich appeared as a judge on the show for the first five seasons of the show, so naturally when I was in Los Angeles, we really wanted to go to one of his restaurants. 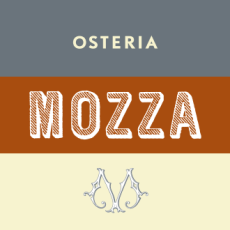 Osteria Mozza is a joint venture between Joe Bastianich, Mario Batali, and Nancy Silverton. Reservations were pretty hard to come by, so we grabbed the only availability we could find on (5pm! ), put on nice dresses, and fought through the terrible Los Angeles traffic to pay a visit to our second favorite Masterchef judge. Sorry, you’re only our second favorite, Joe! J: I’m really happy they were able to hold our reservation for an extra 40 minutes while we were stuck in traffic. The service made me feel like a princess or like it was a very special occasion. K: Everyone was so nice! They make you feel like you are a very important guest. K: I would say this was more modern than a typical Italian restaurant. J: Agreed, it was definitely very chic and classy in an obviously expensive but understated way. J: Flow in every week fresh from Italy and the size of a baseball! It was the softest, creamiest, and most expensive ball of cheese that I have ever eaten. See? It was really the size of a baseball! K: Omnomnomnom – so yummy! 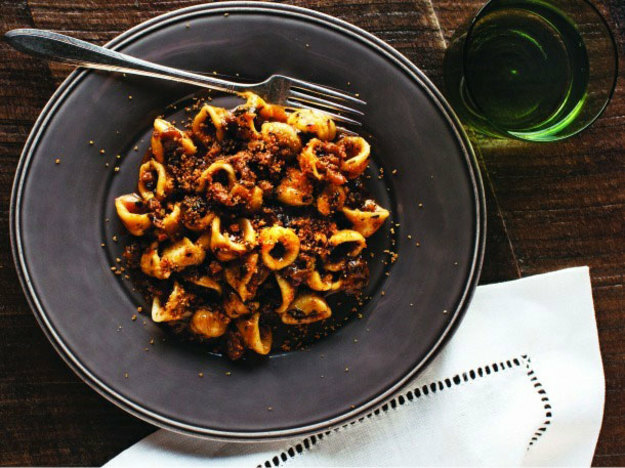 Orecchiette means “little ear” and originates from Southern Italy. J: I could eat this every day. The texture of the pasta was so perfectly chewy. I found the recipe online and may have to try to make this for Thanksgiving. K: I just learned that Mostarda is like an Italian sweet-savory chutney. I liked the pear paired with the duck but the corn was not my favorite. J: I’m not usually a huge fan of cauliflower, but this one was really delicious. I’m not sure what made it so good, but it was fresh, well seasoned, and the yogurt sauce was perfect! There wasn’t a lot of red onion, which I think was also a plus. Final Thoughts: Osteria Mozza is definitely worth the trip for a treat with your favorite sister. The portion sizes were pretty large, so you could even share most things like Kimberly & I did. It’s not a place that I’ll be dying to go to every time I’m in California, but I would not mind going again someday. But first, we need to hit up Gordon Ramsay’s restaurant in New York next time Kimberly visits me! ← Behind the Title: Why The Sound and the Fury?